1990년대 이후 서울의 인구이동은 서울 외곽 수도권 신도시의 개발에 따라 전출이 전입보다 많은 전출초과 현상이 계속되어 왔다. 그러나 2000년 이후 순이동률이 점차 낮아지는 가운데 국지적으로만 전입초과 현상이 나타나고 있다. 은평구, 마포구, 노원구, 중구, 성북구, 동대문구, 중랑구, 강동구 일부에서의 전입초과 현상은 대규모 주택지의 신개발, 재개발 등에 영향을 받은 것이다. 서울시 내부 인구이동은 동일 구 내 등 근거리 이동이 많다. 공간적으로는 송파구, 강남구, 강동구 등 동남권 내의 이동이 활발함을 알 수 있다. Since the 1990s, population migrations in Seoul show stronger numbers transferring out than moving in, a pattern that is due in great part to the development of new towns on the outskirts of Seoul. While the rate of transfers into Seoul is decreasing on the whole, an inflow in population has been observed in certain areas of Seoul since the 2000s, as affected by the development and redevelopment of large-scale housing lots. 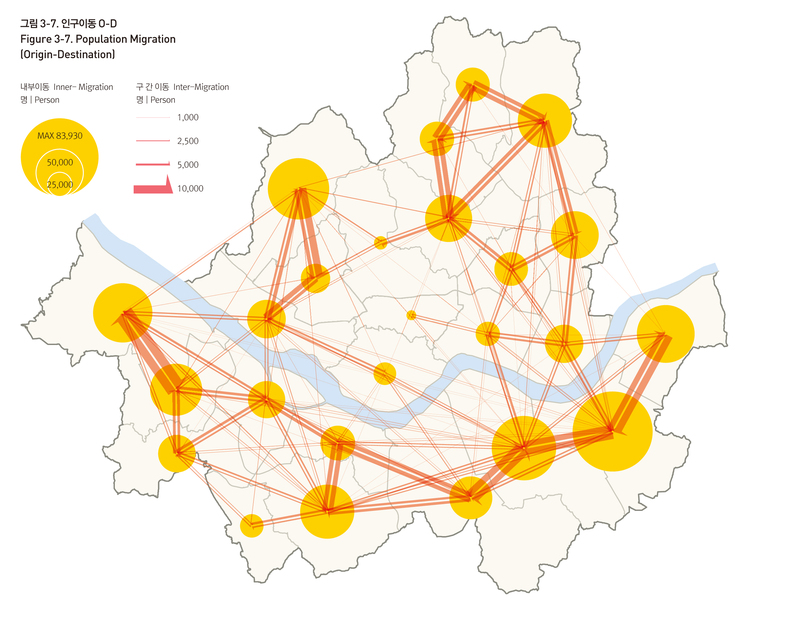 Population migration inside Seoul shows an abundance of short-distance transfers, often within the same district. These patterns are especially visible and active in the southeast areas of the city like Songpa-gu, Gangnam-gu, and Gangdong-gu. 서울의 인구집중은 1980년대까지 전국의 다양한 지역에서 유입되는 양상을 보였으나, 1990년대에 접어들면서 점차 수도권 내에서 유입되는 경향을 보이고 있다. 전입인구가 가장 많은 연도는 1975년으로 이 시기의 순전입인구(전입-전출)는 약 46만 명에 달했다. 하지만 1990년 이후부터는 전출인구가 증가하였고 2010년 순전입인구는 -115천 명으로 전출인구가 전입인구보다 많다. 한편 서울에 타 지역으로 이주하는 전출은, 1980년대 초까지는 인천/경기 지역과 비수도권 지역으로 전출하는 인구가 유사하였으나, 1982년을 기점으로 인천/경기로 전출하는 인구가 많아지기 시작하였다. 신도시 건설, 외곽 주택지 개발, 고용의 외연적 확산 등이 서울인구의 전출을 유발하고 있으며, 서울의 취업, 교육, 문화 기회 등이 인구유입을 촉진시킨다. Until the 1980s, transfers into Seoul came from all over the country, but since the 1990s, they came mostly from within the metropolitan area. In 1975, the year with the strongest influx of residents, the net transfers into Seoul (transfer in-transfer out) numbered 459,569 people. After the 1990s, the number of people transferring out of Seoul increased. As of 2010, net transfer rates stand at -115,023, with greater numbers transferring out rather than in. Factors influencing transfers out of Seoul include development of new towns and suburban housing lots, and the spillover expansion of employment. On the other hand, the unique employment, education, and cultural opportunities in Seoul are some of the factors that have led people to move into Seoul.